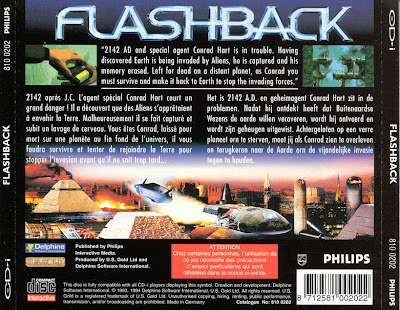 CUT TO THE CHASE: ''Flashback''... to 1991, when a game like this would have seemed interesting. Somebody in the CD-i community must have offended the gods of software conversions. In one year we're not only lost promised conversions of Rebel Assault and Microcosm, but now we've gained this dud. 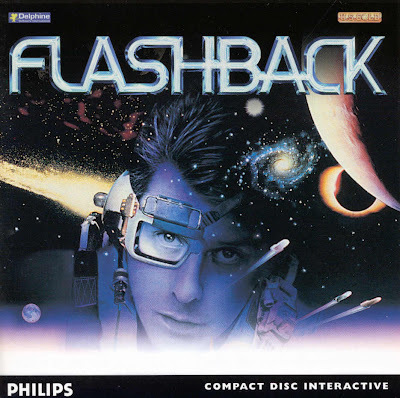 Flashback is a hybrid platform-and-adventure game. You run and jump around various platforms, picking up objects and blasting the bad guys. 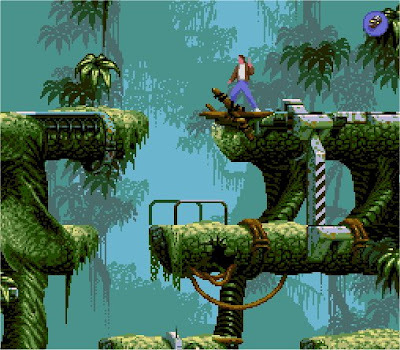 It's like a million other ''serious'' platform games you've seen on the Genesis, like Jurassic Park, X-Men, and Comix Zone. Well, except that those games were occasionally interesting. Perhaps more than anything else, Flashback reminds me of Prince of Persia on the Mac and PC. Its difficult controls are better suited to two hands on a keyboard than a joystick with three buttons. For example, a move to run, jump, and catch the platform above requires an a-button, joypad right (or left), hold the button, and move the button up. CD-i games traditionally haven't had very responsive controls, and the quick, obtuse moves needed here exacerbate that. One other note on the controls -- a controller with a ''three'' button, which on the CD-i means ''one and two together'', is an absolute necessity. Without it, you won't be able to reliably draw your gun, or whatever other action you've assigned to the button. Story-wise, this game puts you in the character of Conrad Hart, a special agent who's discovered aliens are living among humans on Earth. He's captured and shipped off-world, his memory erased. After a failed escape attempt, he awakes in a jungle. This is where you come in. You run, jump, and shoot your way from level to level, meeting people, picking up and using useful objects, trying to find your way out of this ersatz Total Recall. The levels themselves are huge, made up of dozens of inter-linked screens of climbing and shooting challenges. Flaunting the trend since Sonic, the game doesn't scroll. For some reason, the CD-i version also features two thick green bands down the side of the screen. Note to Delphine: putting the inventory of objects or a map in the bands would have made them less annoying. Speaking of letterbox-style bands, the CD-i version features brief computer-animated clips that show Conrad picking up objects, using them, etc. These clips are barely half the size of the screen, and many of them last two seconds or less, making them shorter than the spin-up-the-CD black-outs that precede and follow them. The animations end up being a let-down -- it's hard to believe this game came after Burn:Cycle and Escape From CyberCity, both base-case games with far better animation and video. So, you run, you jump, you shoot. There are a few interesting puzzles involving the use of various devices (keeping elevators in place, opening doors, etc. ), but it's a slow-moving game with little to recommend it. Platform fans would be far better off playing The Apprentice, with its much faster action, or Zelda.